there are many aspects of contemporary cycling that require to be taken into consideration, though most will pass all but unnoticed by those who spend every spare minute aboard their bicycle(s). in summer months (whatever those are), most are simply taken for granted; the great outdoors, a warm breeze, blue skies and verdant pastures often tempt the wintertime naysayers; even members of the civilian population. almost like those who have recently given up smoking or drinking, the advocacy for climbing aboard a bicycle to get to and from work, the coffee shop or simply the unbridled joy of pedalling nowhere in particular, the nouveau cyclist will find it hard to contain their joie de vivre. those of us with our noses buried inside the pages of procycling or rouleur until the next issue comes along, with several kilograms of cycling apparel fighting for wardrobe space and a mini-pump permanently lying atop the microwave in the kitchen are amongst the hardened many. the summertime arrives as a blessed relief from the character building battering we've been receiving throughout the other three seasons, but it is simply one more link in the chain that makes up another year's cycling pleasure. hopefully we are at least partially acquainted with the need for regular fettling of whichever cycles form part of the regular complement, or have the savvy to leave them frequently in the hands of those better equipped. if carrying stuff is a partial necessity, care will have been taken to own appropriate luggage capacity, luggage that will not fare badly during inclement weather and is likely to last more than one season. it will also be of an aesthetic that creates a gestalt; why would anyone want that bar bag to look like an incoherent appendage? but as all this amateur professionalism rolls along unabated, many of us have eyes firmly fixed on those jerseys and outer shells. it's not an unusual fixation to have; bragging rights and style points are adjudged on that which flashes by on uiskentuie strand, or grovels up bowmore main street. on what else would you base aesthetic appreciation? however, if we accept the common notion that layering is the way to ultimate happiness, something needs to be at the base of the pyramid and not unnaturally, that item is referred to as the baselayer. 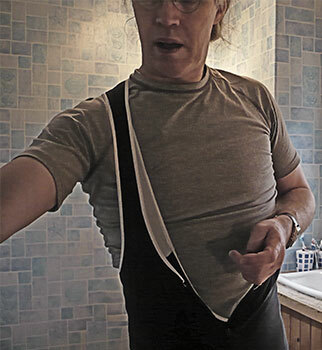 i cycled for several years with a colleague, well-versed in the ways of the peloton, who insisted on wearing a cotton t-shirt as his baselayer. qualms with such a garment are hard to justify when standing stock still in the bikeshed, and there may even be redeeming qualities during the moments of bicycle removal. but add any degree of effort or distance into the equation and those qualities evaporate as quickly as perspiration doesn't. that unsung hero of the wardrobe has a job to do; several in fact. warmth is perhaps number one, but we could likely agree that the cotton t-shirt has that well-covered; number two would undoubtedly be the ability to absorb more perspiration than should be mentioned in polite company while affecting not to be affected. thirdly, it would be a neat coup if that perspiration could be 'pushed' outwards to those more sartorial layers to evaporate in the slipstream. fabrics that accomplish the above are many, several developed by scientific study, one or two simply the endemic properties of natural fibres. merino wool springs to mind. it would also be particularly welcomed by those required to exist in close proximity to the pedallist in their lives, that a degree of odour prevention might form an intrinsic part of the package. 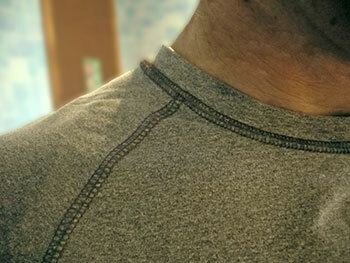 the aptly named velobici ride 't' flatters to deceive in the sense that it is truly a t-shirt should you wish to wear it as such - and come those mythical summer months, i might just do exactly that - but is happy to double as an appropriately conditioned baselayer. constructed from a substance referred to as supplex lycra, it stretches, wears well and has admirable wicking properties, the push to which i referred above. for those of us with leanings towards the more natural fibres end of the spectrum, the combination of dupont engineered supplex nylon and lycra may concern by its oil-based extraction, but from a visible and tactile point of view, you'd be hard pushed to distinguish it from cotton. the ride 't' sports a dropped hem to cossett that back from inadvertant exposure to the elements, and the fit can be described in no other manner than 'close', an adjective it wears with pride. it may also be prudent to check size before ordering; i more often than not find my upper torso to inhabit the world of 'medium', yet the item reviewed states 'large' on the label. i don't mind admitting that at this size, the fit was damn near perfect. velobici is not a name you're likely to find associated with the professional peleton; their apparel bears cycling front and centre, but from a more relaxed perspective. however, the ride 't' loses nothing from this, fulfilling all the functions that any professional or amateur would find it judicious to demand. even when wet, through perspiration or ingress of precipitation, not only did the ride 't' never feel clammy, it didn't feel wet at all. though no specific claims have been made for its resistance to acquiring inordinate and ant-social aromas, even after two days' worth of hard physical exertion, i failed to determine that which would have people moving to an alternative table at debbie's. all boxes would appear to have been ticked. it's a bit of a shame that the ride 't' is one of those garments that will rarely be seen (at this time of year at least) by anyone other than mrs washingmachinepost and myself. how i long for the day that likes to be called 'summer'. 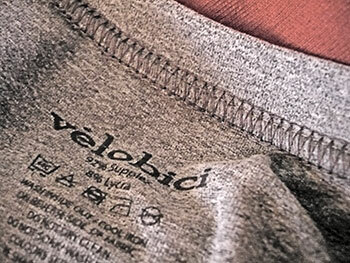 the velobici ride 't' is available in grey melange only, in sizes small, medium, large and extra large. 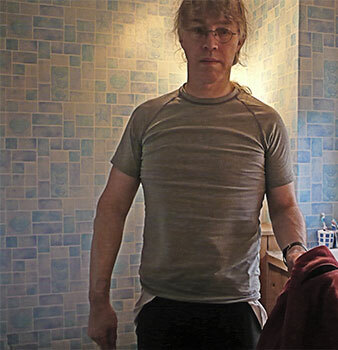 as a lifelong medium, it was a bit of a surprise to find myself wearing a large that fitted superbly. according to velobici's size chart, the large is designed to fit a 98-102cm chest, meaning i ought to be at the low end of these measurements. it's by no means a criticism, simply a statement of fact. regular cost of the garment is an appealing £48, but at the time of writing, velobici are offering it for an even more appealing £33.60 ($52.10). jump at the chance.